Descendants of Irish sailors descending on Belfast for an All-Island Commemoration to the Irish Sailor event on Tuesday May 31st 2016. Descendants of Irish sailors are flying in to Belfast from Australia, America, Canada, Spain, GB and all four corners of Ireland for the Commemoration of the Irish Sailor during the First World War on Tuesday 31st May. The date was especially chosen as the Centenary of the Battle of Jutland, the most important naval battle of the First World War. Descendants of sailors both of the Royal Navy and Mercantile Marine will be in attendance at the Commemoration at Alexandra Dock with HMS Caroline as the backdrop for the event. During the proceedings HMS Caroline will be officially opened. The Royal Navy and Irish Naval Service will stand side by side to mark all from the Island of Ireland who served at sea and wreaths will be laid on behalf of both. Senior political and military representatives from the UK and Ireland will be attendance alongside a German Naval Admiral. The ports of Ireland, Irish Lights and maritime emergency services will also gather with families of those who served, and Belfast City Council will host all attendees for a civic lunch on completion of the ceremony. Irish naval ship LÉ CIARA and British Naval Ship HMS RAMSEY will be in port for the preceding weekend and open to the public as part of Belfast’s Maritime Festival. The Battle of Jutland involved 100,000 men over the course of 36 hours in which time Britain lost 14 ships and 6000 sailors and Germany lost 11 ships and 2500 sailors. Over 350 of the men lost were from Ireland. The most significant loss of Irish life happened very early in the battle when HMS Indefatigable suffered from a catastrophic explosion of her cordite. From over 1000 crew members at least 120 were Irish. 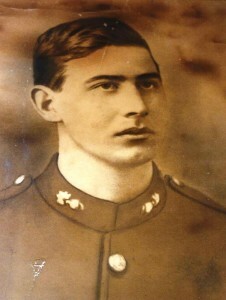 Stoker John Moriarty who hailed from Bere Island, died aged 23 years old, alongside 50 other Cork men. Gunner Lawrence Browne from Malahide was killed at Jutland on Armoured Cruiser HMS Defence, who under heavy fire from 5 German ships, violently exploded killing all of her 904 crew with no survivors – at least 98 of the men killed were Irish. Battlecruiser HMS Invincible was blown in half and sank in 90 seconds, killing all but 6 of its crew of over 1000 men. At least 34 were Irish, including 2 seventeen year old Belfast boys John McCullough and John Cleland Carlisle. Irish sailors were lost on many ships across the course of the First World War including over 350 at the Battle of Jutland itself, 91 at the Battle of Coronel and 62 on HMS HAWKE. As well as Royal Navy ships, Irish men were lost on merchant ships such as MFA WHITE HEAD, a Harland and Wolff built steamship torpedoed in 1917; on HMS SUBMARINE K17 lost in an accidental collision in 1918; and on converted merchant ship HMS BAYANO, torpedoed off Ireland causing bodies to wash up along the Ards Peninsula. In 1918 at least three Irishmen were lost on HMS ASCOT, the last warship lost to enemy action in the First World War, and at least fourteen were lost on the first in 1914, HMS AMPHION. 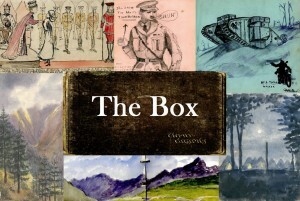 Over 1,500 Irishmen were killed in action serving at sea in the years between. 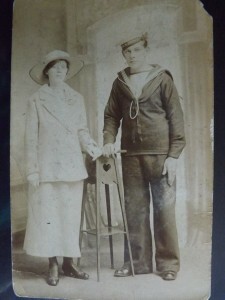 Stoker Peter Kennedy, Royal Naval Reserve, from Ballymena lost on HMS QUEEN MARY at the Battle of Jutland. Peter, a member of Cavehill Orange Lodge lived at Ritchie Street in Belfast and left behind his wife and 4 children under 11 years old. 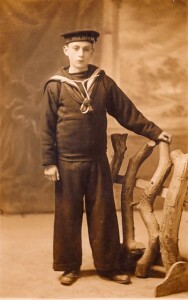 15 year old Midshipman Gervase Ronald Bruce from Downhill, Derry, one of ten cadets lost on HMS MONMOUTH. Five more Ulster teenagers were lost; Belfast boys Stoker (2nd) John McAteer, Boy (1st) William Connell, Able Seaman William A. J. Wilson and Ordinary Seaman Herbert Kelly as well as Ordinary Seaman Henry McNally who was from Draperstown. Leading Stoker Joyce Power left young twins and a pregnant wife in Ballymena after the sinking of HMS HAWKE. His daughter Margaret Hawke Power named after the ship he was killed on. Also drowned was Able Seaman Albert Patterson Wilson whose first daughter Frances was born only 4 weeks later on 14 November. Mariette Isabella Donald was born at the end of 1914, her father Martie Donald not returning to Carrickfergus to meet his newborn daughter. The Gorman siblings from Clifton Park in Belfast lost one brother, Charles on HMS PATHFINDER in September only to hear of the death of another brother, Able Seaman James Toland Gorman, only one month later on HMS HAWKE. Sullatober Flute band from Carrickfergus who lost one of their players Henry McMurran on HMS CRESSY, 3 weeks later suffered yet another tragedy with the loss of another member, Stoker (1st class) Andrew McAllister on HMS HAWKE.